These engaging printable activities can be used to help your students develop an understanding of comparing and ordering numbers, up to 6-digits. This file has 30 task cards that can be used to review comparing 6-digit numbers. Cut apart these number, symbol , and phrase cards and use them to make number sentences. These work great for small group instruction, class games, and as learning centers. 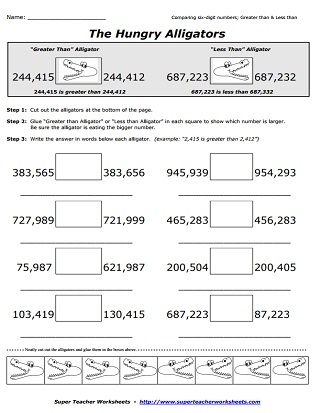 Printable, colorful alligator posters for teaching kids about greater than and less than. Hang them on your classroom wall for reference, or attach magnets to the back and use them on your chalkboard when teaching students about greater than and less than. 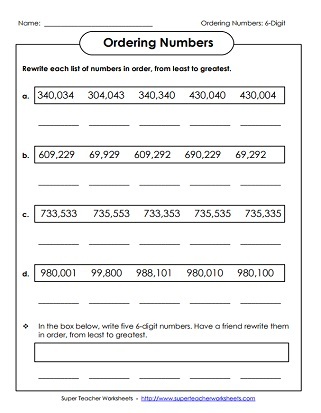 This page has place value resources that require students to work with 6-digit numbers. 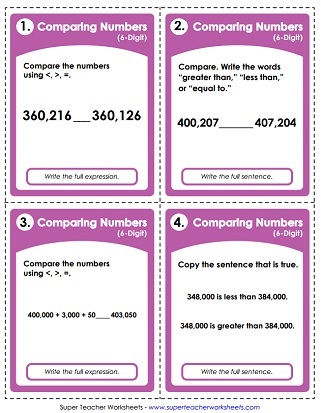 Includes expanded form, place value blocks, and more. This page has worksheets on comparing decimal numbers with tenths, hundredths, and/or thousandths. This page has links to all levels of resources on comparing and ordering numbers.